You've probably heard that to win at Blackjack, you need to be a card-counting mathematical genius. But the truth is, all it takes is a basic understanding of the game and some simple strategy knowledge to beat the dealer. And there's no better place to beat the dealer than Slots of Vegas. We offer the most true-to-Vegas experience anywhere. Our version uses four decks, each consisting of 52 cards. All cards are reshuffled after each hand is dealt so you'll always have a big chance to hit blackjack. What else do you need to know? In our online version of the game, the dealer must hit on a soft 17. And a blackjack beats any other hand. 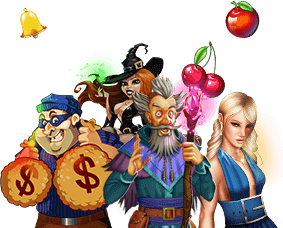 Play Slots of Vegas Online Blackjack and Win Big! Don't be intimidated by all those buttons. Online Blackjack is simply a game of decisions. Your first decision? Decide how much money you want to bet. You can choose anywhere between $1 and $250 per hand, using chips in denominations of $1, $5, $25, and $100. After you've selected your bet, hit Deal. Your second decision? Decide whether you want to hit, stand, double down, or split. You'll make this decision after seeing your two cards and the dealer's one face-up card. If you go over 21, you bust and the dealer wins. If you stay under 21, the dealer reveals his cards and hits if he needs to. If he busts, you win. But if he doesn't bust and his hand is bigger than yours, the dealer wins. You don't have to decide whether to hit, stand, split, or double down blindly. Use our basic blackjack strategy tips to help you figure out what you need to do based on the exact hand you're holding. As we mentioned earlier, playing blackjack online is all about making decisions. , you’ve got five actions to choose from when you play blackjack online. Here's a look at each of them: Deal: Once you've decided on how much you'd like to bet, click the Deal button to get your cards. Hit: If you'd like another card, click Hit and the dealer will deal you one. Stand: If you're happy with your hand, click stand to tell the dealer. Double: If you'd like to double your bet, click Double. You'll receive just one card, though, so make sure you've got a strong enough hand to support it. Split: If you've got two cards of equal value, you can split them into two separate hands. You'll need to place an equal bet on the second hand. You'll be dealt a second card on each hand, and you'll have to decide what you'd like to do after you've received your two cards.